Hello Kitty World (ハロー キティ ワールド (Haroo Kiti Waarudo, ハロー キティ ワールド?)) 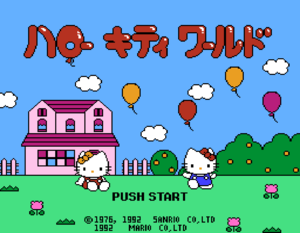 is a Balloon Kid clone and platform game that was released for the Famicom in 1992. 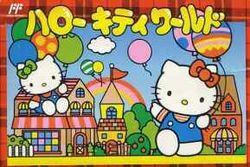 It was developed by a small third party developer named Mario Co, and published by Sanrio Co., Ltd (the Hello Kitty franchise owner) under the name Character Soft Co., Ltd.
Hello Kitty's friend, Tippy Bear, attaches too many balloons to himself and floats away. Hello Kitty and her twin sister Mimmy chase after him. This page was last edited on 9 August 2009, at 22:49.